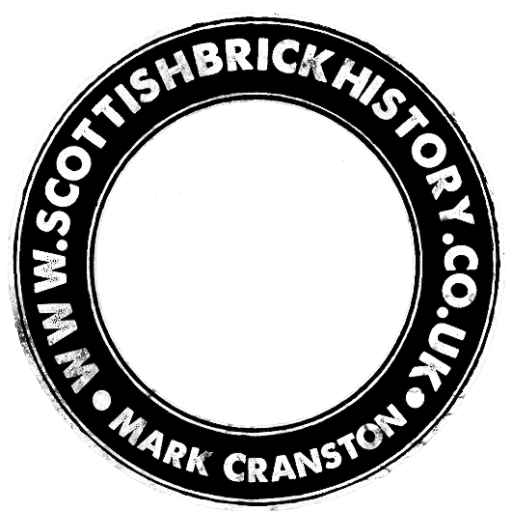 Home / Scottish Brick and Tile Industry / Brickmarks and what they could mean. Brickmarks and what they could mean. 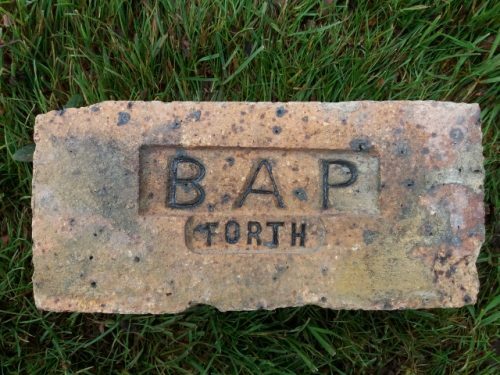 With regards to Scotland, bricks began to be routinely marked around early/mid 19th century. their initials, the name of the brickworks or place of manufacture or indeed any combination of such. The year of manufacture was often stamped also. 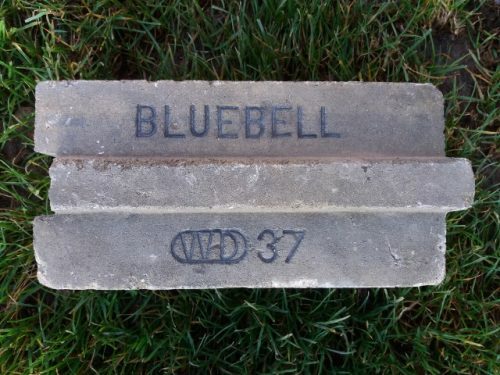 Such stamping of these bricks was one of the earliest forms of advertising on a large scale. The above was the same for building bricks as well as refractory bricks. 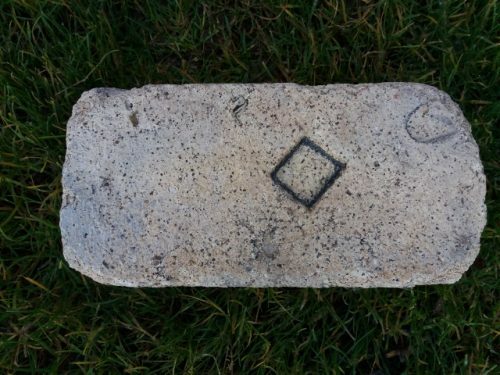 However as the quality of refractory bricks was refined and manipulated through technical and composition change then new marks began to appear. 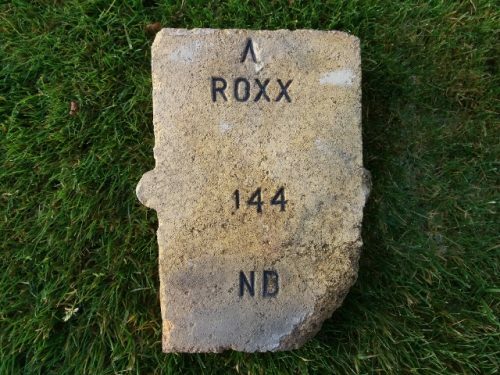 Refractory bricks began to be marked with additional letters, numbers and words. Refractory bricks began to be marked with regards their chemical composition and content. 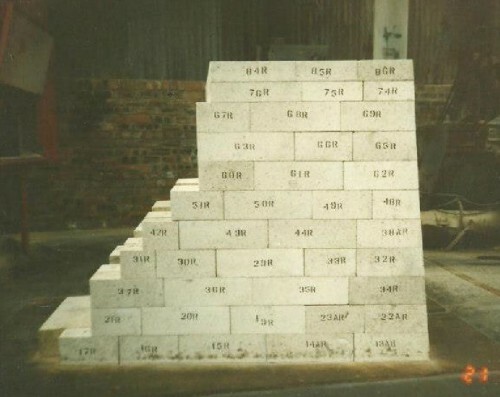 Refractory bricks were made from high quality clay comprising of different percentages of chemical constituents eg Silica, Alumina, Kaolinite, Mullite and Bauxite. Then there are combination such as chemical and manufacturer. and similarly – Sicardo – Silicon Carbide and Dougall. 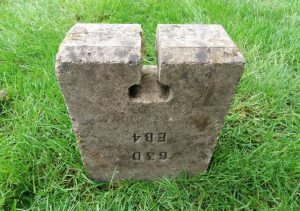 Some refractory manufacturers marked their bricks with the customers name or initials. Below – James Dougall marking a product Coppee for the Coppee Coke Co of Gracechurch Street, London. 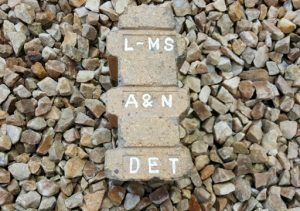 Below – various Scottish manufacturers marking refractory bricks with initials that are believed to stand for numerous South American Railway companies. 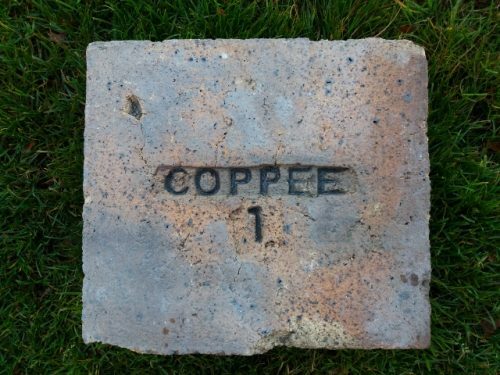 Some refractory bricks and specials were marked with a code that tells a furnace builder etc where in the furnace (kiln, stove, boiler etc) they should be placed. 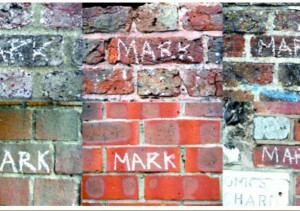 Below – Refractory bricks at the Manuel Works, Linlithgow are stencilled giving each brick a positional code. 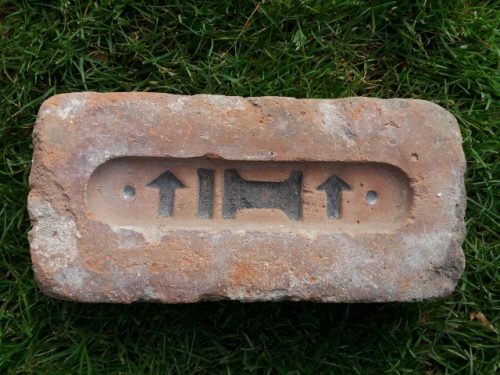 This template below would be used to check brick shapes and once confirmed that they were the same as the template (there were often only subtle differences between special shapes which were hard to identify by eye) then the bricks would be marked with a stencil as per the mark on the template. 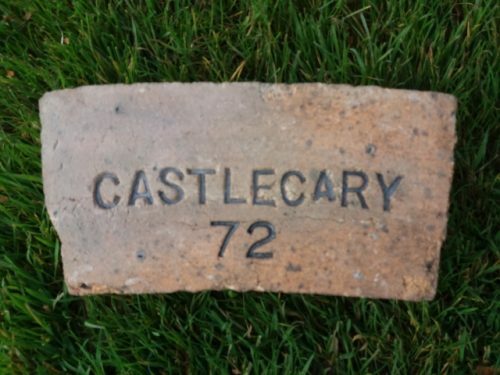 Harley Marshall, formerly of the Stein Castlecary Works, Bonnybridge recalls that Nettle A and Nettle B firebricks were ‘trial’ bricks. They were both made from the same clay with 42% alumina but they were experimental in other composition and firing. He recalls such bricks sitting wrapped in brown paper in the laboratories awaiting examination etc. 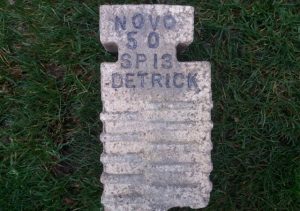 He also states that many of Steins bricks were marked with 3 or 4 figure numbers. 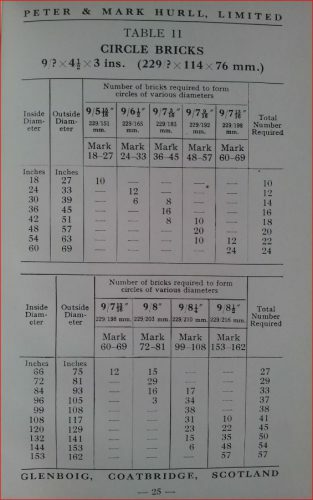 These represented orders or customer identification but often they simply related to a page in the order book and thus related to a single and were thus easy to look up if a customer complained or queried the order. 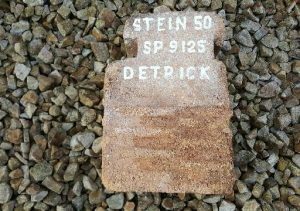 The customer simply stated the number on the brick and someone back at Steins would flick through the order book to the correct page and take it from there. 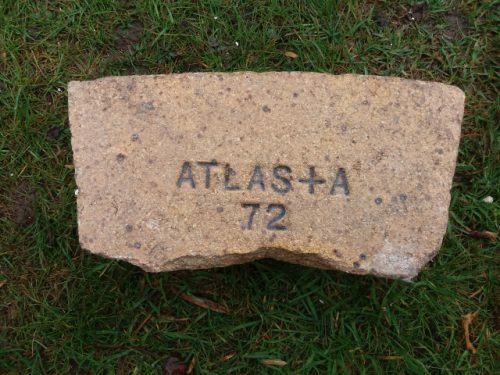 Similarly is appears some companies only added one set of numbers to there brick eg Castlecary 72 (Weir) and Atlas + A 72- and I suspect that relates to the internal diameter of the finished chimney only. 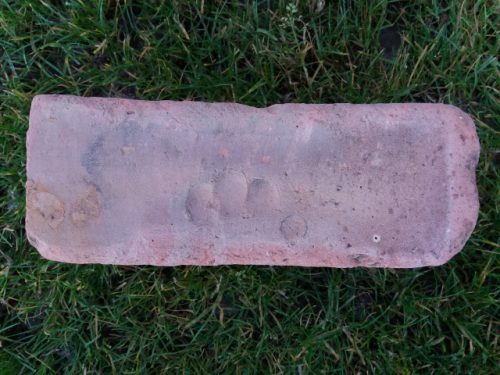 The explanation by Harley Marshall regarding the markings on the chimney bricks has also been confirmed by the finding of a Hurll firebrick catalogue. 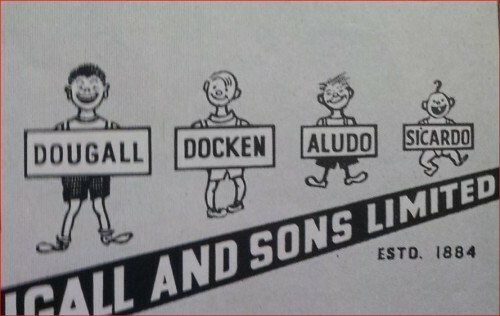 One story of interest concerns the firebricks of John Stein and one of James Dougall & Sons. 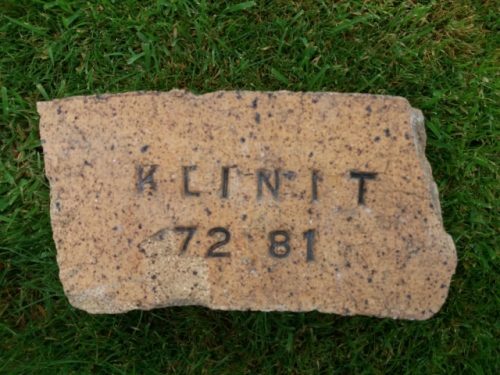 Stein had a range of refractory bricks which he named after plants – Nettle, Thistle, Myrtle, Daisy and Bluebell. 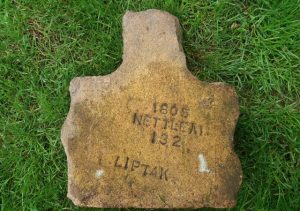 Nettle branded bricks were sold all over the world and in huge numbers. The story goes that James Dougall manufactured a firebrick and called it Docken. He marketed it directly to try and impact on the popularity of the Nettle brick. 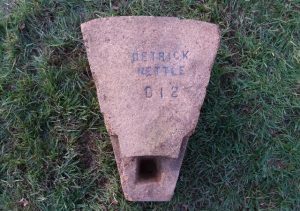 You will know that Docken leaves can be used to reduce the swelling caused by a nettle sting – The trademark Docken was chosen deliberately as it was hoped it would take out the sting of having to pay the cost of a Nettle brick which was a much dearer option than buying a Docken brick. There are also purely accidental marks such as fingerprints, boot prints and animal prints. Some people are of the mindset that finger and in particular thumb prints on bricks were done to authenticate the brick as being hand made. I do not subscribe to this theory. The bricks were handled from the moulds onto the drying floors and then again when being moved to the kilns for firing. 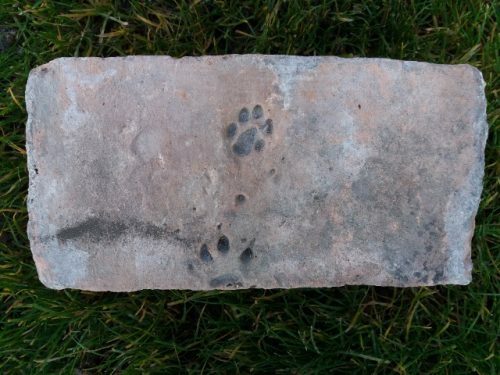 As such the clay was still ‘wet’ and quite simply the thumb print which is normally seen to the top right of the brick was an inevitable mark left behind when handling a damp clay brick. 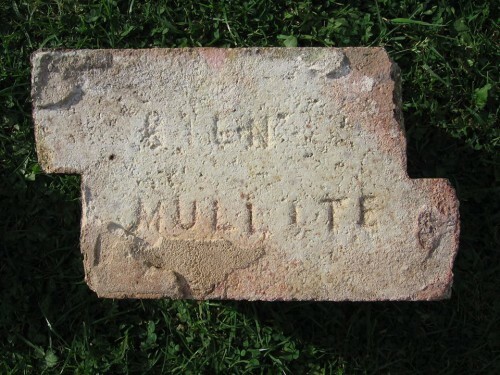 There are many refractory bricks with added numbers and letters that still remain a mystery. 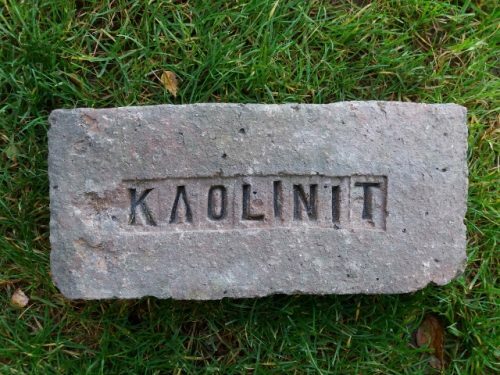 Some bricks were simply marked at the whim of the moulder or someone else involved in its manufacture. Other were marked with symbols. 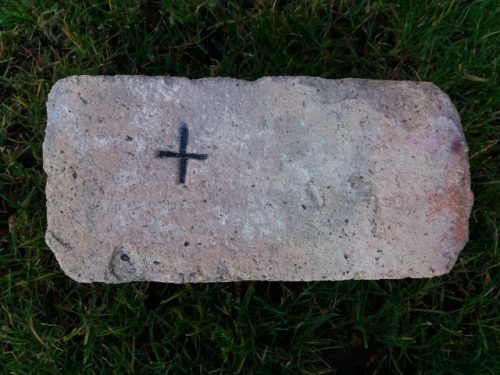 Below – a simple cross marks this early refractory brick. 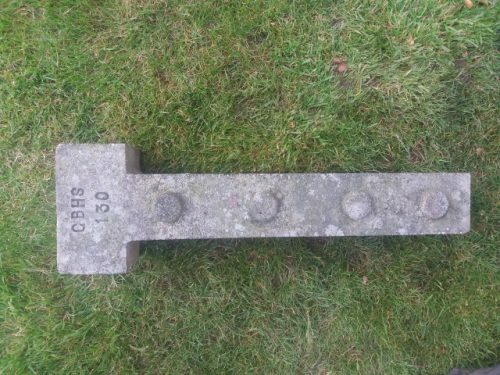 Perhaps it was an individual moulders mark and used to help tally his daily production and keep his bricks separate from a fellow moulder who perhaps used a square as a marker? Below – if anyone clarifies what this ^ I H ^ brickmark symbolises then you get mega bonus point! Harley Marshall, who worked for JG Stein between 1949 and 1991 and finishes his career at the Manuel Works as Export Sales Manager also states that Stein products were sold to the Admiralty for use in ships boilers. The Admiralty would send in orders and these orders would be marked with the order number. Generally they were marked AP then a 2 or 3 digit number. – AP11 – AP stood for Admiralty Pattern. These boiler bricks had a flanged and recessed hole which did not go all the way through the brick. A special bolt with a wide flanged wings on the head was entered into the recess and twisted until the wing were being and within the brick itself. The bolt was then fed through the boiler wall and tightened from the outside pulling the brick onto the boiler wall. The brick on the inside of the boiler thus was solid with no bolt heads showing. Harley also states that Stein firebricks marked 84P were used in the Aluminium production industry. These bricks had ‘non wetting’ properties so the aluminium did not soak into them. The 84 stood for Alumina content and the ‘P’ is believed to have stood for Phosphate bonded. Liptak and Detrick brickmarks – Harley tells me that Stein used the Liptak and Detrick designs and manufactured identical products however due to the 25 year patent on these products as registered by Liptak and Detrick, Stein had to pay a royalty on every one of these specials and stamp them with either Detrick or Liptak. Liptak – Bigelow-Liptak Corporation was originally incorporated in 1927 with the merger of the Bigelow Arch Company of Detroit and Liptak Firebrick Arch Company of Minneapolis, as a direct subsidiary of A.P. Green Refractories Company. Bigelow-Liptak of Canada was incorporated in Toronto in 1940, as a subsidiary of the Corporation. M.H Detrick – The M.H. Detrick Company is a heat refractory manufacturing company, based out of Mokena, Illinois. The company primarilyies suspended refractory constructions and industrial heat enclosures to various businesses. Founded in 1925, the M.H. Detrick Company started in Illinois as heat enclosure manufacturer. Although the company began as a relatively small business, it quickly became an industry leader in heat enclosures, and began adding various heat enclosure products to its line, such as refractory linings and steel. 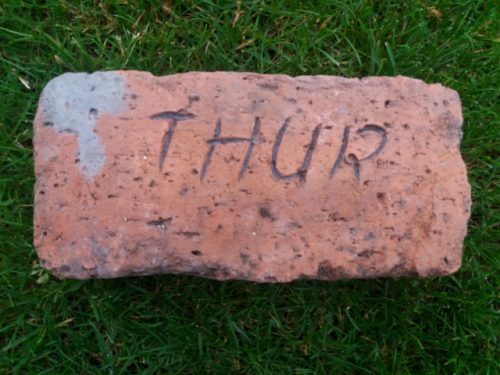 Many bricks are shaped – feathered, wedge etc and I believe that the number stamped on the brick is a simple reference to the angle of the feather or the taper and not necessarily the angle in degrees. It could be a code. eg ETNA No1 could refer to a brick with a 15% taper, ETNA No 2 to a brick with a 18% taper etc. CBHS 130 – He remembers this as possibly being a special design for a glass tank project. 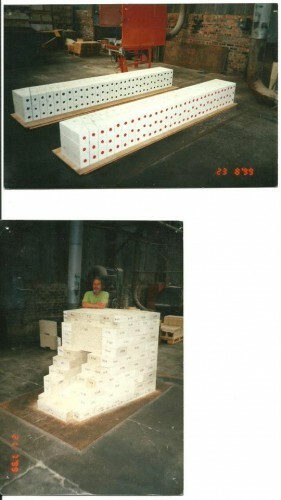 Below – The above is corroborated in part by this photo of a pack of bricks heading for Holland. In the Sillmax SCR product listings there were also PAHH and COHH – these will be shapes for other Hoogovens design Hot blast stove projects. You would have to look at the documents to see which steelworks they refer to – they won’t be in the UK. I think it was POHH for Port Talbot, ACHH for Acominas (Brazil), AHHH for Ahmsa (Mexico), HOHH for Hoogovens themselves. 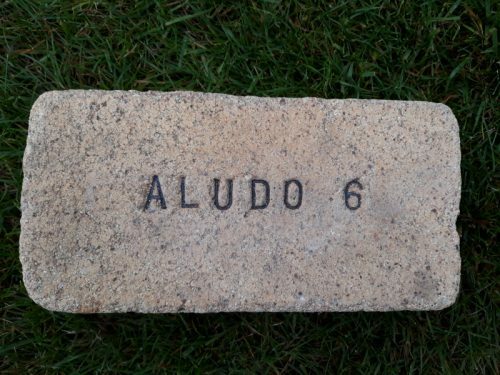 As I recall GR-Stein’s Manuel-made range of high alumina bricks – Stein and Sillmax – had a convention that brick names in the two ranges did not have the same code number – this was partly (mainly?) because bricks in green ‘as pressed’ and in ‘fired’ form look pretty much the same – green / gray in the former case and biscuit / beige in the latter so they could be easily mistaken for each other. They had at that time (1975-1983) in the Stein range – Stein 45D, 50, 63, 63A, 70D, 73D, 84, 86, Mullite and Mullite F and in the Sillmax range – Sillmax 55, 63, 63D, 63S, SCR and 90. So with the exception of ’63’ all bricks had a different ‘end code’. 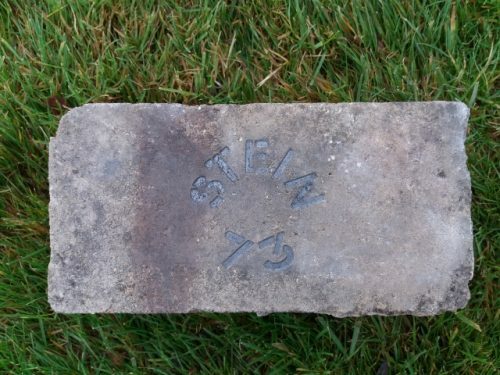 So a brick marked SCR had to be a Sillmax SCR brick, a 45D had to be a Stein 45D etc and I think – but I’m not sure – that Sillmax 63 were only available as a stove chequer brick so obviously distinctly different from a Stein 63 which would not be a chequer brick. 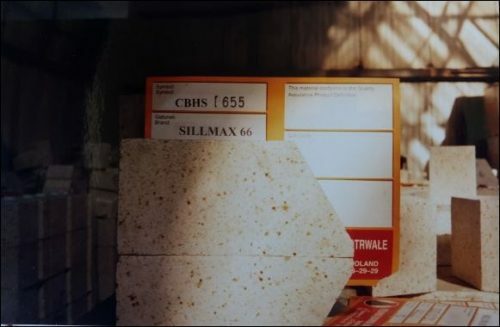 SCR – Brick Brand – in this case Sillmax SCR – SCR stands for ‘Super Creep Resistant’ – I believe Sillmax SCR is a double-fired Sillmax 66 i.e. it goes through the tunnel kiln twice whereas Sillmax 66 goes through once. Sillmax SCR was used in the hot blast stove outlet area. 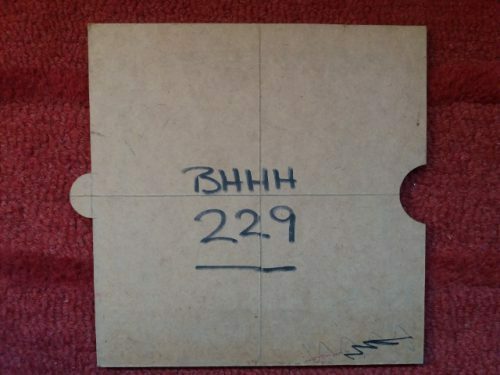 It’s likely that shape RCHH 112 would not have been supplied in any other quality / brand unlike the shapes used in the stove walls or in the combustion chamber walls or in the chequerwork. Silica was used in the top of the stoves in the domes and the uppermost part of the walls. 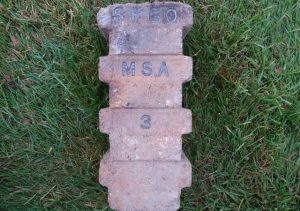 Previous Article Scottish bricks manufactured for Indian Railway Networks ? 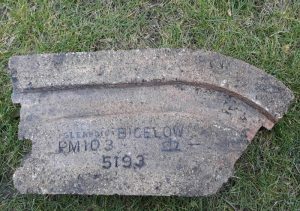 Glenboig and Nettle bricks found in Christchurch, New Zealand. 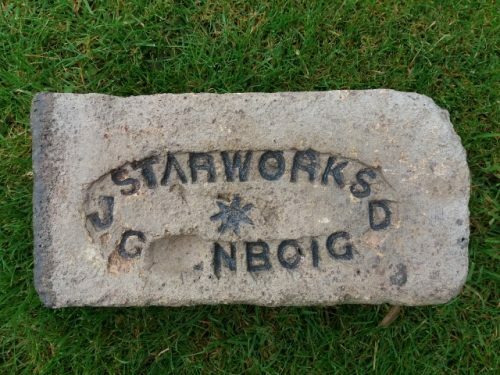 Found at Inverkeithing Stein, Castlecary Fireclay Works, Castlecary, Stirlingshire. Stein, Manuel Firebrick and Refractory Works, Whitecross, Stirlingshire. 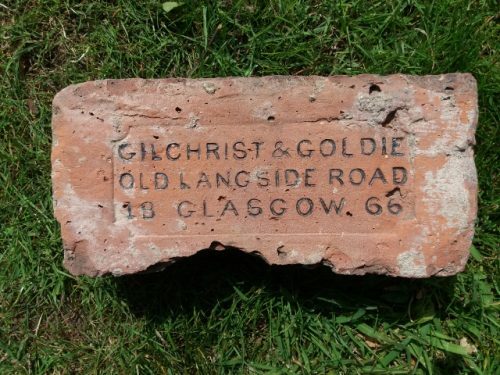 Stein & Co, Anchor Brickworks, Denny, Stirlingshire. Milnquarter Fireclay & Gannister Works, Bonnybridge, Stirlingshire. . .
Found Clydebank Stein, Castlecary Fireclay Works, Castlecary, Stirlingshire. Stein, Manuel Firebrick and Refractory Works, Whitecross, Stirlingshire. Stein & Co, Anchor Brickworks, Denny, Stirlingshire. Milnquarter Fireclay & Gannister Works, Bonnybridge, Stirlingshire. Liptak is a variety of suspended arch tile – this example is broken at the narrow end. ..